How Growth-Focused Politics Helped Build Vulnerability in Louisiana’s Flood Zones | "Global Possibilities"
Updated | As coastal communities from the Carolinas through New England track Tropical Storm Hermine, which struck Florida yesterday as that state’s first hurricane since 2005 before weakening, it’s worth looking back at the disastrous deluge in Louisiana for wider lessons. A good starting point is two photographs. When the elegant plantation home was built in Baton Rouge, La., some two centuries ago, it was elevated a few feet aboveground — providing greatly boosted odds of limited damage in one of the Mississippi delta’s frequent big floods (not to mention protection from termites and the like). When the contemporary ranch was built in a development in Ascension Parish nearby, it was set on a concrete slab — deeply vulnerable to floodwaters like those that came in the state’s astounding mega-rainfall in mid August. The photos were taken by Craig E. Colten, the Carl O. Sauer Professor of Geography at Louisiana State University and a longtime student of why communities expand in harm’s way. 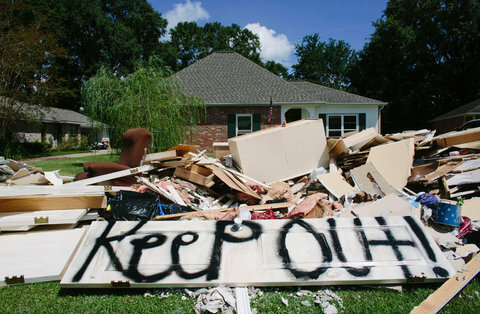 He wrote a compelling piece for The Conversation digging in on the growth-oriented policies and perverse incentives that added greatly to the losses in Louisiana’s great flood of 2016. But I also recommend you read a deep dive into factors behind the scope of losses in the August flood, by Edward P. Richards, who directs the program in law, science and public health at Louisiana State’s law school. That piece includes some helpful math and flood history explaining why “one in a thousand year” storm labels or the like can greatly overstate the rarity of extreme events. From a land use perspective, the primary problem was that local planning and zoning commissions have known that the areas are prone to severe flooding for at least the 30-plus years since the 1983 flood. Homeowners and small businesses were not warned about the risk and were not advised to buy flood insurance if they were outside the FEMA 100-year flood zone. They relied on planning and zoning commissions to determine if developers were building in safe locations. This is a problem for every community in the United States that is subject to periodic flooding. There are many communities with millions of homes that have built themselves beyond the drainage capacity of their watersheds and face the same difficult choices about development and relocation as does the area currently flooded in Louisiana. In both cases, human decisions magnified the consequences of extreme natural events. Planning and permitting enabled development in areas that had experienced repeat floods, and agencies had failed to complete projects designed to mitigate flood damage before the storms hit. This part of Louisiana, which is known as the Florida Parishes because it once was part of the Spanish territory of Florida, is a natural laboratory for flood studies. A benchmark flood in 1983 caused some $344 million in damages. Additional dramatic floods occurred in 1990 and 1993. In 2001 Tropical Storm Allison dumped 19 inches of rain on Baton Rouge over the course of two days and unleashed extensive inundations. And just last March, 9 to 15 inches of rain inundated much of the same area. However, these efforts have not been sustained. Suburban sprawl has spilled onto floodplains and placed residents at risk. For example, the relatively new incorporated community of Central in East Baton Rouge Parish reports that 75 percent of its territory is in the 100-year floodplain. According to initial news reports, up to 90 percent of the town’s houses sustained damage in this month’s floods. Between 2000 and 2010, the population of Ascension Parish grew from 76,617 to 107,215, and Livingston Parish’s population increased from 91,814 to 128,026. Developers have intensively built up areas along the Comite and Amite rivers and in the territory where the two rivers converge and back up into Bayou Manchac during floods…. There has been no effort to deflect development or require safe construction practices within the 500-year floodplain, even though the region’s flood history suggests that broader flood mitigation efforts would be prudent. 2,100 properties across the U.S. enrolled in the National Flood Insurance Program have flooded and been rebuilt more than 10 times since 1978, according to a new analysis of insurance data by the Natural Resources Defense Council (NRDC). One home in Batchelor, Louisiana has flooded 40 times over the past four decades, receiving $428,379 in insurance payments. More than 30,000 properties in the program, run by the Federal Emergency Management Agency, have flooded multiple times over the years. Those homes, known as “severe repetitive loss properties,” make up just 0.6 percent of federal flood insurance policies. But they account for 10.6 percent of the program’s claims — totaling $5.5 billion in payments…. According to FEMA records, Louisiana homeowners with flood insurance have poor track records when it comes to preparing for the next storm. The state leads the nation in severe repetitive loss properties, with more than 7,200 of the NFIP’s 30,000 multi-flood homes. 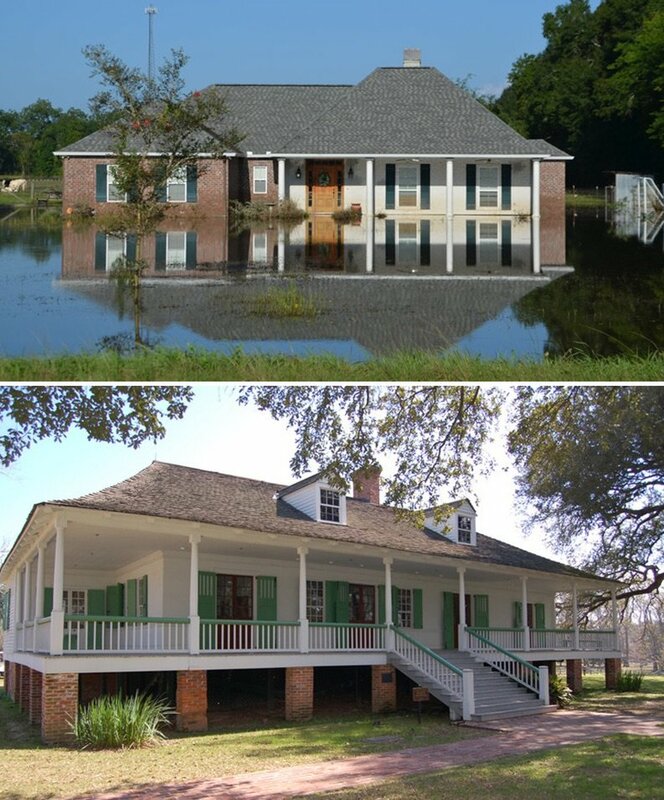 Since 1978, these Louisiana houses have received $1.22 billion in flood insurance payments — 22 percent of all repetitive loss claims, according the NRDC.